Mining Past LTE Samples – Protect Water for Future Generations. Uranium mining in the Black Hills is a bad idea. It has already left radioactive wastes in western South Dakota. 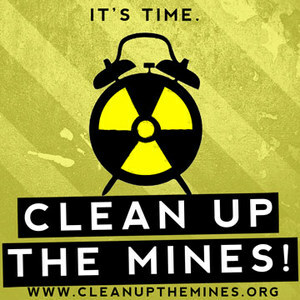 In fact, the mining messes from the 1950s – 1970s have still not been cleaned up. Why would we want to start mining again? It’s like throwing more trash on top of an overflowing garbage can. It just adds to the mess. We need clean water and a healthy environment to support our local economy – and our children. Let’s clean up the old messes and not create any new ones. No new uranium mining in South Dakota. In other words, the mining company would have its say. But local residents could end up with less water and polluted water – but couldn’t have a say. I can’t see any reason to do that. The company’s Vice President in charge of environmental matters used to work for Atlas, a mining company in Utah. Atlas left 16 million tons of radioactive waste on the banks of the Colorado River, and he was in charge of clean-up. Atlas went bankrupt in 1998. That left taxpayers to pay millions to clean up the mess. This story was repeated again and again by company after company during the last uranium boom. So trusting a uranium company is not what comes to mind. Least of all one that doesn’t want me to have a say about their plan to pollute my water. When I was a kid, I was taught to clean up after myself. But uranium companies haven’t figured that out. There are 272 old uranium mines and prospects in South Dakota. The vast majority have never been cleaned up, and some of them are over 50 years old. Multiple studies done by School of Mines professors and graduate students show that these old mines are putting contamination into our water. They’re polluting the Moreau, Grand, and Cheyenne River watersheds. Besides mines, companies also left old drill holes, mine shafts, and even holes large enough for a person to fall into in the southern Hills. One picture in a School of Mines study shows someone dangling his feet into a hole large enough for two people to fall into. So why should we let uranium companies start mining in the Black Hills again? Haven’t we learned our lesson? If you have ever studied uranium mining and milling, you know that it creates huge costs to taxpayers. Companies mine and then move on, leaving a huge radioactive mess behind. Companies that looked for uranium in the Black Hills in the 1960s and 1970s left thousands of exploration holes behind. Many of these holes were not plugged. Water moves up and down the holes, which can contaminate clean water. Miners also left open shafts, open pit mines full of acidic and radioactive water, and holes big enough for a person to fall into. We have no reason to think that uranium companies have changed. And now the companies that are trying to mine uranium in the Black Hills are from other countries, like Canada and Australia. All they have to do is pack up and go home, and we would be left with the mess again. The best way to avoid this is not to start mining uranium again in the Hills.